I really enjoy being a surveyor because I am involved in leading edge property development projects [that] assist the client over a number of years to turn their dream into a completed site. 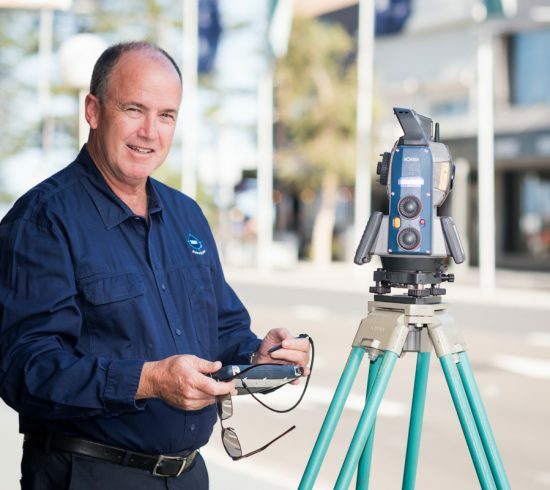 These days, surveying requires the use of complex hi-tech surveying equipment, computers and software that is changing at a rapid pace. Robotic instruments, laser scanners and fixed-wing, multi-rotor drones (UAVs) are becoming mainstream tools for surveyors, and a lot of time needs to be invested to keep up with new technology. To be a good surveyor you need to be able to look at the results of the field measurements and office calculations, understand them, and have reality checks on the ‘black box’ answers that the equipment and software is giving. Being a Registered Surveyor also requires keeping up with changes in property law and requirements for the preparation and lodgement of plans for registration at New South Wales Land Registry Services. From a personal point of view this can be challenging, particularly with some of our larger development projects that require bespoke subdivision strategies. About 20 years ago the Association of Consulting Surveyors joined up with Copyright Agency to launch a case for fair compensation for surveyors’ plans, which are put on public record with copies on-sold by the government or their commercial operators. These plans are creative works containing IP belonging to the surveyor. JBW Surveyors [who I work for] has been a member of Copyright Agency for many years as we believe strongly in getting some form of compensation for copies of our plans which are sold.